Perform each exercise in this circuit one after another with minimal rest between exercises. Complete the circuit 3 times before moving on. The walk-out into cobra position is a beginner level dynamic warm-up exercise that strateches the hamstrings, hip flexors and abs. 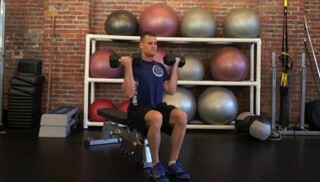 The seated dumbbell curl is a beginner exercise. 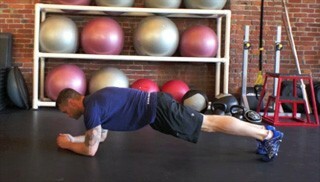 This exercise targets the biceps and is suitable for any fitness level. Perform each exercise in this circuit one after another with minimal rest between exercises. Complete the circuit 3 times to finish the workout.